Seurat is today best remembered as the inventor of Neo-Impressionism, a famous technique that used tiny dabs of contrasting color to create continuous images. This study—one of eight he devoted to the punishing labor of stone breakers—precedes Seurat’s revolutionary new manner by several years but already indicates his departure from the high Impressionist style. Picked out with short strokes of contrasting color, a pile of stones at the center of the composition appears convincingly pulverized, broken down from masses into particles, from form into color. Mme. Vve. Léopold Appert, Paris. Private collection, Paris, in 1958. It wasn’t unusual in the 19th century to see men and women hard at work in the countryside hitting stones with sledgehammers. The rocky French soil continually yielded large stones that had to be broken up and removed before fields could be planted. Artists a generation or two older than Georges Seurat had painted the subject in empathy with the plight of the peasant, or to offer a romanticized view of country life. But Seurat took a completely new approach. This view of stone breakers, painted when he was about 23 years old, is all about color. Seurat studied the writings of Michel Eugène Chevreul, a French chemist who had developed a theory of how colors are perceived by the human eye. Chevreul taught that a color looks most vivid placed next to its complement. For example, the woman on the right wears a blue shirt. Blue is a primary color. Its complement is orange. Seurat chose that color for the woman’s hands and face. Because the two are next to each other, the blue seems bluer and the orange, more orange. Seurat experimented with this technique throughout the painting. 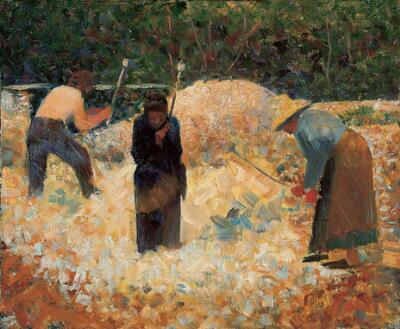 The short, even brush strokes Seurat used for the piles of stones were also an experiment. They prefigure Pointillism, the revolutionary technique he would develop a few years later. In Pointillism, the entire picture is composed of tiny dots of color, carefully juxtaposed so that the viewer perceives a blend of those colors, a process known as optical mixing. For Seurat’s stone breakers, his experiments with color and brushstroke overwhelm the subject matter, making it hard to tell what’s going on.